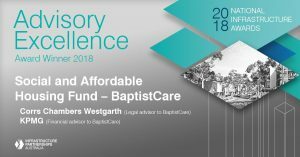 Australia’s leading independent law firm, Corrs Chambers Westgarth, together with KPMG, have won the National Infrastructure Award for Advisory Excellence for their role in advising BaptistCare in its partnership with the NSW Government and the Social and Affordable Housing Fund (SAHF). Both Corrs and KPMG advised BaptistCare on its successful bid for the NSW Government’s SAHF to deliver 500 new social and affordable units and tailored support services for a period of 25 years. According to Corrs’ lead partner on the matter, Airlie Fox, “Through this partnership with the NSW Government, BaptistCare will be able to provide housing and tailored support to a significant number of additional seniors and single-parent families who are experiencing housing stress. The Judging Panel awarded Corrs Chambers Westgarth, and KPMG, the Advisory Excellence Award because of “their leadership and collaboration with the NSW Government to improve services for vulnerable communities in a complex policy environment”. 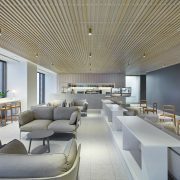 The Corrs team lead by Airlie included partners David Warren (Construction), Clare Corke (Banking and Finance) and Peter Calov (Property), with Consultant Trevor Danos providing strategic advice throughout the process. BaptistCare is a registered Community Housing Provider under the National Regulatory System for Community Housing. The organisation has been providing affordable housing since 1953. The SAHF is a key component of the NSW Future Directions for Social Housing in NSW strategy that will result in more social and affordable housing dwellings linked to tailored support, to help households gain independence. The Government should spend an additional £20bn on infrastructure investment each year and establish a German-style publicly-owned National Investment Bank, according to a prominent progressive think tank. The Institute for Public Policy Research (IPPR) will make the recommendation later this week. Increasing investment spending by £20bn by 2021-22 would lift UK government investment as a share of GDP to around 3 per cent of GDP, which would be the highest for the UK since the financial crisis but still only roughly level to the OECD average. The Bank of England raised interest rates earlier this month to 0.5 per cent on the basis of its view that there is virtually no longer any non-inflationary slack left in the British economy and that, without a higher cost of borrowing, price rises risks getting out of hand. But the co-author of the IPPR report, Michael Jacobs, disagrees with the Bank and argues that there remains spare capacity in the UK, which ramped up investment spending from the state can help fill. “The brute fact underlying our low productivity and investment rate is that the economy suffers from deficient demand. With businesses not investing enough, only the Government can take up the slack,” he argues. Mr Jacobs also argues that with UK government borrowing rates on the market still negative in inflation-adjusted terms ministers have a golden opportunity to invest cheaply. “At current negative real interest rates, next week’s Budget is the moment to increase public investment. It will pay for itself in higher growth and tax receipts,” he says. The IPPR recommends that “much” of this funding could be delivered through a new publicly-owned National Investment Bank, modelled on Germany’s successful Kreditanstalt für Wiederaufbau, which helped to rebuild the infrastructure of that country after the devastation of the Second World War. The proposals for considerably higher public infrastructure spending and the establishment of a new public investment bank were in Labour’s June manifesto. But the IPPR argument also chimes with calls made recently by the Communities Secretary, Sajid Javid, for the Chancellor to borrow considerably more in order to spend on the delivery of more housing. An Economic Justice Commission run by the IPPR – to which this work on infrastructure will feed into – published an interim report in September which said Britain’s existing economic model was “broken”. It’s members include Sir Charlie Mayfield of the John Lewis Partnership, Jurgen Maier, the boss of Siemens UK, the McKinsey managing partner Dominic Barton, the economist Mariana Mazzucato and the Archbishop of Canterbury, Justin Welby. The Commission’s final report will be published in the autumn of 2018. The circa $1 billion Darling Harbour Live precinct project, on which Clayton Utz is the primary legal adviser, has won the Advisory Excellence Award at the 2014 National Infrastructure Awards convened by Infrastructure Partnerships Australia (IPA). With construction expected to be completed in 2016, the Darling Harbour Live precinct project will provide Sydney with world-class facilities for a diverse range of convention, exhibition and entertainment events. Clayton Utz was appointed in August 2011 as primary legal advisers to Sydney Harbour Foreshore Authority (SFHA) and then to Infrastructure NSW (INSW), on the project. The award judging panel acknowledged the major and complementary outcomes the projects advisers had secured for the State and for the people of NSW, through smart structuring and the use of interactive and competitive bidding. 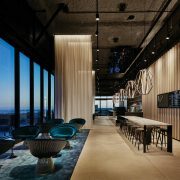 Other advisers on the project are KPMG (Financial Adviser to the State), Evans & Peck (Transaction Adviser to the State), Capella Capital (Financial Adviser to Darling Harbour Live) and Herbert Smith Freehills (Legal Adviser to Darling Harbour Live). This is the latest accolade for the Darling Harbour Live precinct project, which was also named Asia-Pacific PPP Deal of the Year at the 2013 Project Finance International (PFI) Awards. 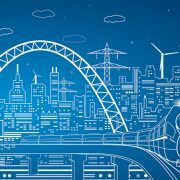 IPA’s National Infrastructure Awards celebrate and acknowledge the innovation and excellence of Australia’s public and private sectors in the delivery of infrastructure. Bendigo Hospital Project, on which Clayton Utz is legal adviser to the Department of Health (Victoria), was also a finalist for the Advisory Excellence Award.